Getting into a top online college or university is a competitive process. Using criteria such as standardized test scores, prior GPA, recommendation letters, and character assessment, competitive admissions enables schools to be selective in assembling their student body, as well as practice quality control. Online classes demand a high level of peer interaction as part of the learning process, so accepting students with proven academic ability makes it more likely that the school can provide a better experience for everyone in the virtual classroom. However, upsides exist to having open admission colleges available to students. Students who wish to enroll in an online college should understand that even though open admission is not the norm, it has its merits. Some online schools offer open admissions -- or open enrollment -- which requires only a high school diploma or GED for admission. While some might argue that open admissions can dilute the quality of the student body due to lack of selectivity, the upside is that it is more inclusive for many students who otherwise might not have access to a college education. Online open enrollment colleges allow students to overcome past challenges such as learning disabilities, poor test scores, or an unsatisfying early college experience. Open admission colleges allow students to have a second chance at pursuing a brighter future. What are the Best Online Colleges With Open Admission in 2019? California's second-largest private, nonprofit university, National is known for promoting diversity and inclusion through its year-round open enrollment admissions policy. The school maintains 27 campuses throughout California and one Nevada location. Students admitted to National can access an extensive virtual library and deep discounts on textbooks, as well as competitive buyback prices and free shipping, made possible through a partnership with the country's largest mail order textbook supplier. This online-only university offers programs at every level for adult students with work and life experience. In addition to upholding an open enrollment policy for general admission, Walden offers a generous transfer-credit policy, accepting prior credit for life experience, work experience, military service, placement exams, and online training. Students may enroll in a two-week, risk-free trial course before committing to a four-year bachelor's degree. Florida National University operates a traditional campus in Miami, as well as an additional campus, training center, and online learning division in Hialeah. The school's open-door admissions policy also allows for continuous enrollment throughout the year. In addition to upholding a generous credit-transfer policy for applicants, FNU also offers several tuition incentives including scholarships for government employees and military servicemembers, as well as corporate alliance opportunities and employee reimbursement plans. Admissions requirements for prospective Liberty University students vary depending on each applicant's level of education and the program to which they are applying. For high school students applying to an undergraduate program, acceptance is granted based solely on high school transcripts; a letter of recommendation is required only if the student's GPA is below 3.0. Transfer undergraduate and graduate students must supply college transcripts and/or military experience in addition to their high school transcripts as part of their Liberty application for advanced programs. Though admissions requirements are different on campus and vary per program, students applying to undergraduate programs at Sullivan Online need only submit proof of a high school diploma or GED, as well as indicate how they intend to pay tuition, to be considered for enrollment. Applications are accepted on an ongoing basis throughout the year. Students work closely with an admissions advisor for the duration of the application process. Not only is Granite State one of the country's open admission online colleges, the school also allows students to apply for free using its online application system. Students are admitted on an ongoing basis to the college's four terms per year. Granite State generously accepts a wide variety of prior education and military transfer credits and, unlike most online colleges and universities, will extend financial aid benefits to students enrolled in only one course. Bryant and Stratton comprises numerous New York campuses, as well as locations throughout Virginia, Ohio, and Wisconsin in addition to its global online campus. Students applying to the college's online programs will work with a dedicated admissions advisor to submit their high school transcripts, prepare for an entrance interview, and complete the free online application for admission. Online semesters offer more start dates per year than traditional programs, in January, March, May, June, September and November. Salem International University is one of the nations' colleges with open admission. However, students applying to the university's education or nursing programs do need to meet additional prerequisites, including minimum GPA and minimum standardized test scores or certification requirements, respectively. Graduate, transfer, and international students are also required to submit additional materials, depending upon their program of study, to secure enrollment into SIU. Grand Canyon University offers open enrollment to students 16 years of age and older who are interested in completing an undergraduate program online. Though the university incorporates Christian principles into all of its academic programs, applicants are not required to submit a statement of faith or confirm their alignment with a particular religious affiliation, with the exception of those applying to theology programs. Graduate and transfer students may be required to submit standardized test scores and/or meet a minimum GPA requirement to gain admission into their program of choice. Bellevue's undergraduate applicants enjoy a rolling deadline for open enrollment into programs in four academic areas: arts and sciences, business, information technology, and professional studies. Students applying to bachelor's programs are required to submit proof of a high school diploma or GED and pay a one-time application fee of $50. Graduate applicants may be required to uphold a minimum GPA requirement in addition to submitting all prior transcripts and work experience. There are 23 Rasmussen College campuses spanning six states in the U.S., in addition to its online location. While students are not required to submit standardized test scores along with their transcripts or GED, Rasmussen does require some applicants to take an entrance placement exam. A dedicated admissions advisor will help to determine if this assessment is necessary on a case-by-case basis. The college boasts a quick and convenient online enrollment process that can be completed in less than 10 minutes. NAU is home to more than 30 university campuses across 10 North American territories, including comprehensive online programs for undergraduates, graduate students, and residents of Canada. Freshmen, adult, and military students are required simply to submit proof of a high school diploma, GED, or completion of a two-year degree with at least a 2.0 GPA to be granted enrollment into one of more than 60 undergraduate programs at NAU. The university offers discounted tuition for military students as well as the NAU Tuition Advantage discount to students who complete at least 13.5 credit hours per academic quarter. As its name suggests, City University of Seattle is headquartered in Washington, but the school also operates numerous locations across the state and in eight other countries around the world, including Canada, Switzerland, and Vietnam. As one of the country's colleges with open admissions, the admissions process requires only the submission of transcripts along with completion of the online application. In addition, international students may be required to submit proof of English proficiency to be granted enrollment; dedicated admissions advisors are available to guide applicants through the enrollment process. Argosy University's online programs are managed through its Phoenix location in Arizona, though the school operates more than 25 physical campuses in 13 states across the U.S. Though Argosy's admissions requirements vary by program, many undergraduate programs offer open enrollment, giving students flexible options for submitting prior transcripts. Students applying to the Bachelor of Science in Business Administration, for example, may submit one of several accepted forms of proof of a high school diploma, GED, or equivalency placement test documentation, or an associate degree, with proof of English proficiency, if applicable. University of Maryland University College Online offers more than 90 academic programs, with more than 25 locations in the U.S. and more than 140 extended campuses worldwide. As one of the country's open admission colleges, the only admissions requirement for undergraduate students is to provide proof of a high school diploma or GED; no standardized test scores or minimum GPA is required to qualify for enrollment. Prospective graduate students are required to have a bachelor's degree from an accredited higher learning institution to be granted admission into an advanced program. Strayer University's online campus is one among dozens of locations in 16 states and territories spanning the U.S. Students applying to a bachelor's degree program at Strayer are required to submit only two items: a completed application form and proof of high school graduation or equivalent. Graduate students, however, are required to have a bachelor's degree from an accredited institution, as well as meet minimum GPA and standardized test score prerequisites. Kaplan offers a comprehensive selection of online programs to distance learners through its global campus, which is one of more than 15 campus locations in the U.S. Students applying to Kaplan's undergraduate programs must demonstrate English proficiency and make financial payment arrangements in addition to submitting high school transcripts to be eligible for enrollment. Some programs may require additional conditions to be met for admissions consideration. The university offers a generous credit-transfer policy and a three-week trial course prior to enrollment, tuition-free. Capella University is headquartered in Minneapolis, but provides more than 40 degree programs in six academic areas at locations throughout the U.S., including on its online global campus. While the university upholds a general open enrollment policy, some programs have specific admissions requirements beyond the basic submission of prior transcripts and proof of English proficiency; prerequisites including minimum GPA, letters of recommendation, and/or faculty interviews are determined by each school and program individually. Baker College serves a student enrollment of nearly 24,000 at more than 15 Michigan campus locations. The online campus offers more than 15 degrees and programs to tens of thousands of distance learners around the world. As part of its "right to try" open enrollment policy, Baker requires only a high school diploma or GED, and there are not minimum GPA or minimum standardized test scores requirements. Students are accepted into Baker programs year-round on a continuous enrollment schedule. This for-profit university has campus locations in Colorado Springs, Denver, and Aurora. The school operates primarily as an online college. Founded in 1965, Colorado Technical University began as a vocational training school for individuals with military backgrounds. Today, this university features a military education department and offers online associate, bachelor's, and master’s programs with eight start dates throughout the year. Transfer students with an associate degree can earn a bachelor’s degree in 17 months. Open admissions, or open enrollment, is an inclusive college entrance policy that accepts any student who has a high school diploma or equivalent certificate. Online college admission requirements for schools that participate in open admissions differ from selective universities. Typically, open enrollment colleges require no college entrance exam, such as the ACT or SAT. Instead, these schools require students to take academic assessments or placement tests. Students who completed a college entrance exam are usually not required to take a placement test. ACT or SAT scores determine course placement. While some open enrollment colleges require students to submit recommendation letters, the majority of these schools only require official high school transcripts or a GED certificate and proof of residency to admit students. In contrast to universities with rigorous admissions policies that typically feature two start dates per academic year, online open enrollment colleges offer start dates every five to eight weeks. Regardless of a school’s admissions policy, students who need financial aid should complete the Free Application for Federal Student Aid, which is an online application for federally funded college tuition assistance. What are the Benefits of Open Admissions? The initial practice of open admissions coincided with the civil rights movement in the 1960s. This sweeping admissions policy promoted the diversification of postsecondary student populations across the country and continues to boast numerous benefits. With substantial financial aid opportunities, online open enrollment colleges empower students to earn a degree and advance professionally regardless of their current situation. Students who are not strong test takers can pursue a degree without the added stress of performing well on costly college entrance exams. Relying on placement test scores, online open enrollment colleges ensure that students receive the academic training appropriate for their educational level. Students with high placement test scores opt out of basic courses, which saves them time and money. Additionally, some colleges with open admissions feature no tuition costs and provide access to free classes and free technology, such as laptops and writing software. Does Open Admissions Mean a College is Easier? Although open admissions ensures access to higher education, the successful completion of college courses requires significant student commitment. While pursuing a degree is complex, students can make college less stressful by studying regularly, developing time-management skills, and using available resources. While SAT or ACT scores do not influence acceptance to an open enrollment college, submission of scores is occasionally required during the application process. Schools that do not request college entrance exam scores require students to take a placement test, such as the ACCUPLACER. What is the Minimum GPA You'll Need? Most online open enrollment colleges admit students without requiring a minimum GPA. As long as prospective students graduate high school or complete an equivalent program, such as the GED, admission to the school is granted. Students with below average high school GPAs who score high on a placement test bypass remedial coursework. Are There Any Academic Requirements for Open Admissions? Online college admission requirements emphasize inclusion, therefore, policies that rely on selective measures, such as previous academic achievement, do not exist. Students who excelled in high school and are applying to an open enrollment college have the added benefit of receiving credits for introductory courses and accelerating their degree. Although a minimum GPA is usually not required for admission to an open enrollment college, students are often required to maintain a minimum college GPA once admitted. For example, some schools may require students to earn a minimum 1.75 GPA to graduate. Typically, students must earn a 2.0 GPA or better in their major to receive their degree. How Do I Find Out if My School Offers Open Admissions? Colleges typically provide admissions information on their website. By reviewing available information about admissions requirements, students can determine if their school features open admissions. Are Schools With Open Admissions Accredited? Online open enrollment colleges acquire and maintain accreditation with the same accrediting bodies affiliated with schools with selective admissions. Students who plan to enroll in an online college should only consider accredited schools. Accreditation plays an important role in the quality of an academic program and the transfer of credits. 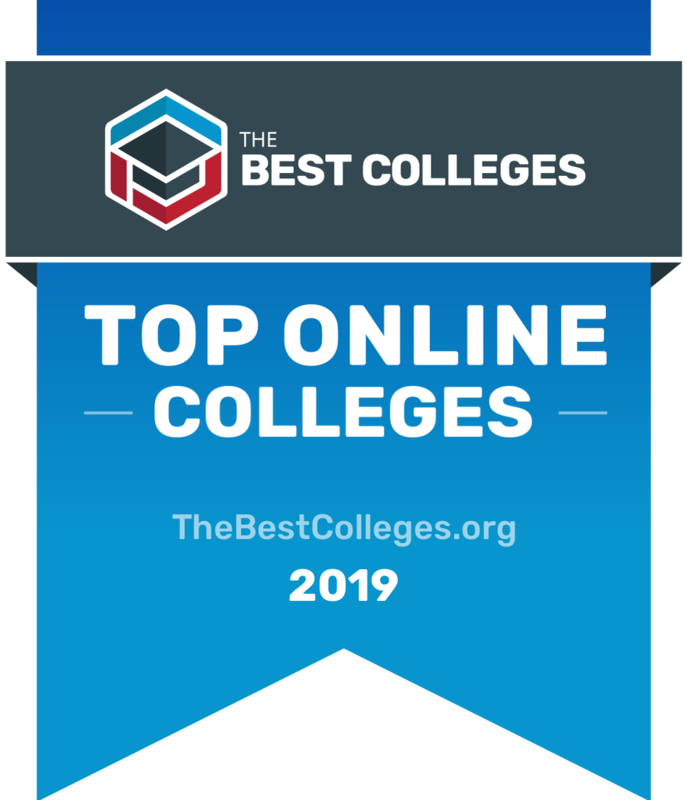 We included only the highest quality schools on our list of the top online open enrollment colleges of 2019. While all these schools have open admissions, they are still being ranked on other standards. We developed our rankings based on the following criteria, which are all weighted equally at 25%: student satisfaction (as measured by graduation and retention rates), peer and instructional quality (as measured by acceptance rate and student-teacher ratio), affordability (as measured by tuition costs and availability of financial aid), and credibility (as measured by years of accreditation, reputation, and awards). All data was gathered from objective, independent sources such as The National Center for Education Statistics and College Results Online, as well as from each school’s website and its respective representatives. *The schools listed above are sponsored. Sponsored school listings are distinct paid advertisements and are clearly marked with a “SPONSORED” or “FEATURED” tag to distinguish them from editorially ranked schools. Learn more about how we rank schools or contact us with questions. To determine the best online colleges and universities with open admissions, we examined the most important factors for prospective students, mainly common predictors of future success and a school’s commitment to online programs. This boils down to admissions rate, student loan default rate, retention rate, graduation rate, and the percent of students enrolled in online classes. All data points are taken from information provided by colleges and universities to the National Center for Education Statistics. Each factor is weighted evenly in order to give an objective view and determine the top 19 online colleges and universities with open admissions. To calculate our rankings, we looked at a school’s ranking when organized by a single factor, and then averaged each category’s ranking to find an overall score: admissions rate (20%) + default rate (20%) + retention rate (20%) + graduation rate (20%) + percent of students enrolled in online classes (20%) = final score.